Saint Perpetua guides the executioner's knife. I write this on the Feast of the English Carthusian Martyrs, St. John Houghton and companions. I’m afraid of martyrdom. In fact, I’m afraid of experiencing anything bad - even things as silly as mean tweets - because of the things I believe. And I shy away from even the minor discomforts of fast and abstinence. I moan and complain at the normal aches and pains of being 52. I fear more cancer; I’m afraid of the increasing infirmity of age; I’m as worried as an old biddy about my health. And at the same time, I'm not only afraid of martyrdom and the opprobrium of the world, and of the discomfort of even mild, modern penances, I'm afraid of the judgment of God. Really afraid. I know what I am. (I don’t know it as well as He does, but even the little bit I do know is horrifying.) So I know what I deserve. And this fear of judgment, just punishment and aversion to penance - perfectly natural and I bet more or less universally experienced - is exactly why we commemorate and venerate the martyrs. What do they "witness" to us? That the ideas of the world, the assumptions and priorities of this life, are false and our fears - of penance and what the Benedictines call conversion of life - are unfounded. 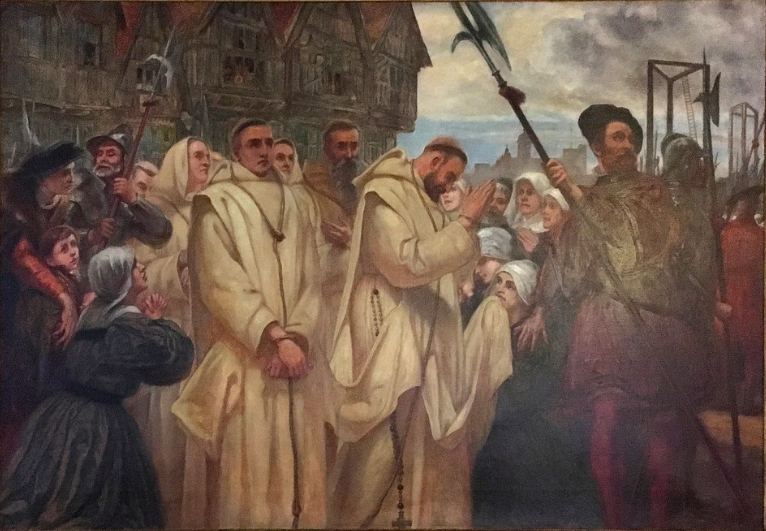 Today is the beginning of the period in which, from 1535 to 1537, the London Carthusians were murdered, martyred, by the Protestant English state. May 4th is the feast of the English Carthusian Martyrs, St. John Houghton and companions. God is mercy and love, he loves us to the point of arousing in our hearts the strong desire to follow Him in the radicality of a silent and collected life. It happened in San Bruno many centuries ago, but even today men and women follow this example, this ideal of life. And it happened to me. God saw my condition as a sinner and wanted to give me the opportunity to follow this path which aims to lead me to holiness and to union with Him, which is our whole truth and our salvation. I am an aspirant to the difficult life, not because of mine, but for the goodness and mercy of God. From a very early age I feel the call to consecrate my life to God, but I let time pass, because I thought that this style of life was not for me. But when God calls, restlessness remains in us and we only calm down when we respond, with love, to this call of love. I always thought of a radical life, and when I met the Charterhouse I fell in love with the lifestyle of these men and women. I found many difficulties along the way and I still find them, but with God’s grace everything is going well and these difficulties only make me stronger. In November 2017, the Good God through a benefactor, gave me the gift of being able to make my experience in the Charterhouse of Our Lady Medianeira, here in Rio Grande do Sul. If I had to describe my experience, this would be the title: I WAS 30 DAYS IN THE SKY! The title could not be anything else, I was really in heaven, surrounded by good angels, charitable, loving, available, patient and full of faith and love for God and his Church. I can say that I met several saints in the Charterhouse, but Father Prior emanated an angel’s air, a kindness and humility that moved me. I sat near him only a few days, then I went to the choir next to the Father Master. At first I was lost in the pages of that big and heavy book, and the Prior, perceiving my difficulty, left his place in the choir and came to help me, or sometimes even from his place showed me what the page of the book was. When I looked at his eyes, I saw only goodness. What a holy man!!! God be blessed. Today I asked a friend, a good priest, the question, “Is it true that going to heaven has very little to do with you being, as the world's expression has it, ‘a good person’?” In other words, in the natural sense, being “nice” has pretty much nothing to do with sanctity. I suspect that real holiness looks quite different from the world’s ideas about it. I would only add, “He would say that about St. Francis de Sales upon first impression. But the song would change abruptly as soon as he found out what the saint of gentleness thought about ‘women’s reproductive rights’.” The things we call good are quite different from what the World calls good. And they’re getting more and more different every day. But even so, the world is certainly looking for heroism, no less Catholics than all the other people flocking to see “Avengers Infinity War” this week. In fact, perhaps Catholics more than anyone else. We are called, are we not, and despite what Cardinal Kasper would have us believe, to holiness, which is nothing less than heroism. Recently in a conversation with Fr. Oblate Director we talked about the admonition of the Lord to “be perfect as my Father in heaven is perfect.” I said that when I first started towards my conversion (35 years ago!) I remember that I had found this passage a huge obstacle. It was impossible, you see. I knew full well even then that Christian Perfection - sanctity - was actually completely impossible for me to do. At the time I thought it was unjust, or at least unfair, of the Lord, the Son of God, to demand perfection as the price of entering heaven. And I was completely right. It was impossible. Of course, since then I’ve learned the answer to that apparently insoluble conundrum. It’s impossible for us. It’s not impossible for Him. He is the one who makes you perfect. All you need to do is cooperate. What did Felicity and Perpetua and those early Roman martyrs look like as they were being martyred in the arenas of Carthage and Rome? What did it look like from the stands? Not much, I would think. Two weak women, chased by animals across the bloody sand, the outcome a foregone conclusion. It was North Africa so it was probably a hot day. They might have been nothing more than the half-time show, a sort of mid-credits scene between the main event of the games. It might have been the moment to pop out and get another cold beer. I guess that it was ugly and brutal. Not at all the stuff of late Victorian romantic paintings. But what did it look like from the point of view of Heaven? Perpetua and Felicitas were exposed to a mad heifer. Perpetua was tossed first and fell on her back, but raised herself and gathered her torn tunic modestly about her; then, after fastening up her hair, lest she look as if she were in mourning, she rose and went to help Felicitas, who had been badly hurt by the animal. Side by side they stood, expecting another assault, but the sated audience cried out that it was enough. They were therefore led to the gate Sanevivaria, where victims who had not been killed in the arena were dispatched by gladiators. Here Perpetua seemed to arouse herself from an ecstasy and could not believe that she had already been exposed to a mad heifer until she saw the marks of her injuries. She then called out to her brother and to the catechumen: "Stand fast in the faith, and love one another. Do not let our sufferings be a stumbling block to you." By this time the fickle populace was clamoring for the women to come back into the open. This they did willingly, and after giving each other the kiss of peace, they were killed by the gladiators. Perpetua had to guide the sword of the nervous executioner to her throat. Here’s the point that always made me pause in the midst of my fears and weakness: they asked God for more suffering! And they hardly even noticed being martyred. They were in ecstasies. How does that even work? That was the point that made me start to think it was possible to lose my fears, and eventually my silly resentment at the Lord's command faded, overwhelmed in awe at the idea that these were real people, and these things really happened. There was obviously something much greater going on here than mere suffering. Scuttling quickly back to the safe, terrestrial ground of pop culture, I rather like this description of the mechanics of grace given in this scene (in this otherwise extremely stupid movie). I have a friend who does more or less what I do. He writes and blogs and podcasts about the Church, the Francis papacy and all that. And he’s prone to getting fed up, even discouraged. He knows his failings and shortcomings as a Catholic and is frustrated by them. And like all of us, he tends to forget that these are his crosses, these are the things God has given him specially, today, to suffer and offer up. Whatever you’ve got going on right now, these are the opportunities we’ve been given. It doesn’t look very heroic in the world's terms, but this is what we've got today, right now. My frustration with my physical weakness, my often tormenting memories of my past sins, my failures in life, my stupid selfishness, my cowardice, my mistakes; this is the raw material I've got. It’s not pretty, but this is the stuff of our repentance, all we’ve got to offer up to Christ on the Cross. How are we going to get to the “place,” the spiritual maturity, the indifference to this life, of a St. Felicity? Or a St. John Houghton? Or a Moses the Black, a Mary of Egypt, or any of the greats whom we remember? By this little path, that looks like nothing to us, but in Reality – the point of view of heaven, which is the only one that matters - is the royal road. And as per the saints, we will look back on that road and see something miraculous. We'll see it is not paved with thorns and stones as we had thought, but strewn with roses.